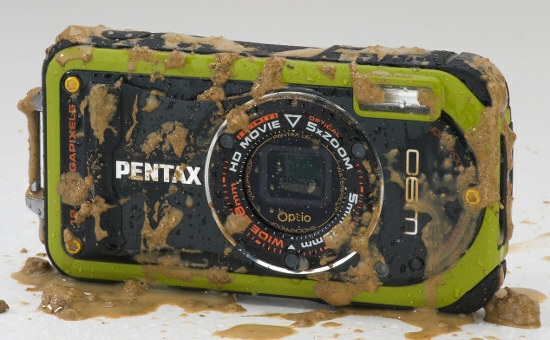 Pentax continues to create competitive models for the "lifeproof" point-n-shoot category. The Optio W90 performed well during our tests, and is sure to please the active user who needs a camera that is as tough as they are. Read more in our Full Conclusion. Pentax has hit the outdoors with the rugged new Optio W90, an all-weather, rough and tough camera meant to be taken on any adventure, no matter where it leads. This unit boasts 12-megapixels combined with a versatile 5x zoom lens, which is housed completely inside the camera's body. Shots are framed on the 2.7-in TFT color LCD with an anti-reflective coating and 230,000 dots of resolution. A unique innovation on this new "lifeproof" camera are three LCD lights around the lens for up close macro picture taking; and by up close Pentax means as close as 1cm from the front of the lens! The W90 comes in Black, "Pistachio" Green, and Orange (available sometime in July 2010) and sells for around $260 - $330 U.S. (see our list of retailers for the best deal).